Animal Bond: Wild Halflings gain the ability to bond to a specific animal (as a Ranger animal companion). Animal Speech: Wild Halflings gain the ability to speak to any animal (as Wild Empathy). Wrangler: Wild Halflings gain a +2 racial bonus to handle animal skill checks. Xenophobic: Wild Halflings start with Halfling only. Bonus: Common, Elven, Saurian and Sylvan. Bite: Wild Halflings gain the bite natural attack, 1d4 damage. Replaces a nature bond ability. 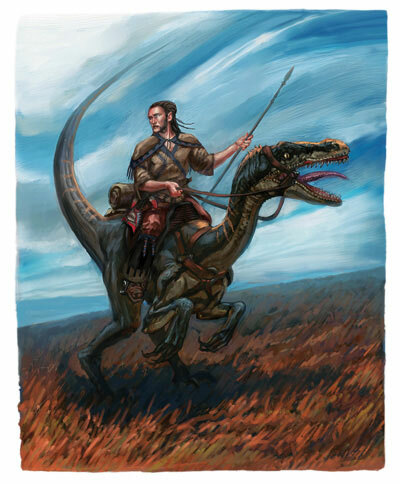 The halflings living on Dinoterra are tribal barbarians that ride raptors. Their favorite prey is T-Rex, but they’ll eat any meat. They are mostly a reclusive and secretive people, with a silent language that merges psionics, sign and body language. A few Rangers and Druids have been able to have a limited conversation with Wild Empathy.